There are a million reasons why cats are lovable. They have soft fur. They have the most beautiful eyes. They are great pets. They are a cure for depression. They can make you famous in the internet. And a ton of other things. Now here's another good reason why you might want to consider getting a cat as a pet. Apparently, cats can be magicians. They can slid into spaces that are half their size. 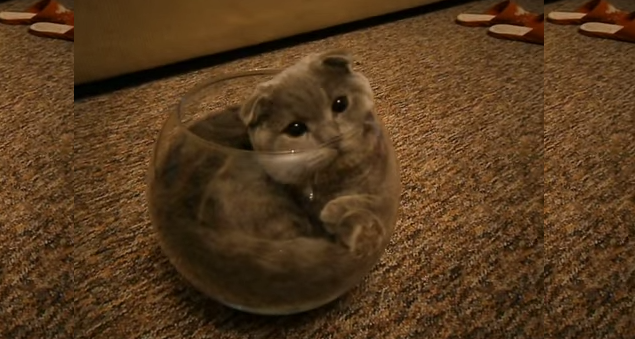 Take the following cat who slid with unbelievable ease into an empty and small fish bowl. You'll be scratching your head, how the hell did it just do that? Watch for yourself. In case you are wondering, the cat in the video is a Scottish Fold.